E-Learning can be defined as anything you learn electronically, whether it’s an instructional video, a question you answered using Google or articles you access electronically to write an essay. More formally, and relevant to the work we do at Capytech, ‘e-learning is any course or structured learning event that uses an electronic medium to meet it’s objectives’ (Elkins, Pinder 2015). This structured learning is framed in a Learning Management System or LMS, a system that a student can work through and meet the objectives of the course. This can be self-led, or blended (with teacher led elements), but by framing the learning in an LMS, progress can be mapped and quality assured. Embedding course content in an LMS is where Capytech can help. We are experts at taking your content and creating e-learning to suit your course outcome. To make sure you get the best out of your system, we work using a simple levelled approach that can help you define the complexity of the system you require. E-learning can be defined into three different levels and unless you’re intimately familiar with e-learning, you may not have heard of them. So let’s explore each level. At this level, the content is not interactive. The user is passive, with no interactivity within the lessons. It is very similar to presenting a PowerPoint presentation, or providing PDF/Word documents. By placing the content in an LMS structure, the course is organised however, progress can be tracked and distribution of content is simpler. At this level, we incorporate interactivity such as hyperlinks to relevant sources; videos, audio and simple drag and drop quizzes. We will also be using a lot more multimedia at this point, and applying multi-sensory techniques to enhance learning. Level 2 can be delivered using a number of different mechanisms. For instance at Capytech, we deliver it via a Learning Management System (LMS) and also on device using the iBooks application. This level sees a student as an active part of their learning. The final level is the creation of more complicated simulation or scenario based training. For example, a company training security guards might use a level 3 scenario to teach their employees how to react under a variety of circumstances. By creating a branched adventure story, training is far more relevant than reading a manual. Whatever level, using an LMS to frame your courseware offers a highly organised, interactive and cost efficient way of managing your training. 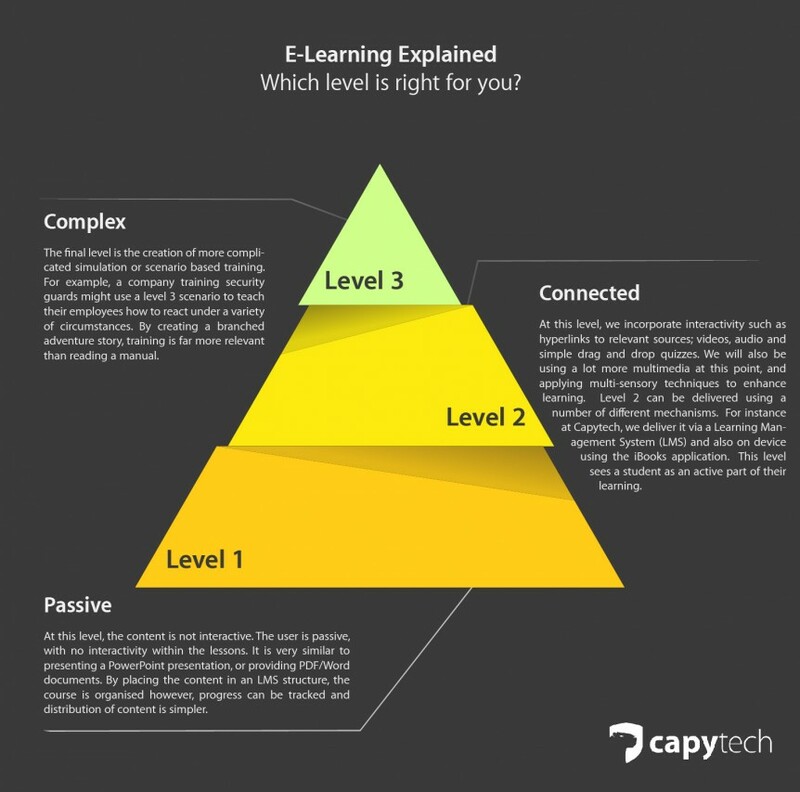 Capytech specialise in developing level 2 and level 3 e-learning content and can work closely with you to establish how best to interpret your courseware using these levels. Importantly we do this mostly using HTML5 technology which gives us rapid and cost effective development cycles. If you think your training might benefit from being enhanced for e-learning – then feel free to get in touch.